In addition to providing sun protection, it's important for coastal areas to provide shade structures that can withstand higher wind speeds. This process had always included creating a custom shade for each project, which was time-consuming during the quoting process. In order to save time, Superior Shade came up with a solution of high capacity shade! Specifically beneficial for coastal areas, Superior Shade created a collection of standard shade structures that have been designed and engineered for high wind speed requirements. 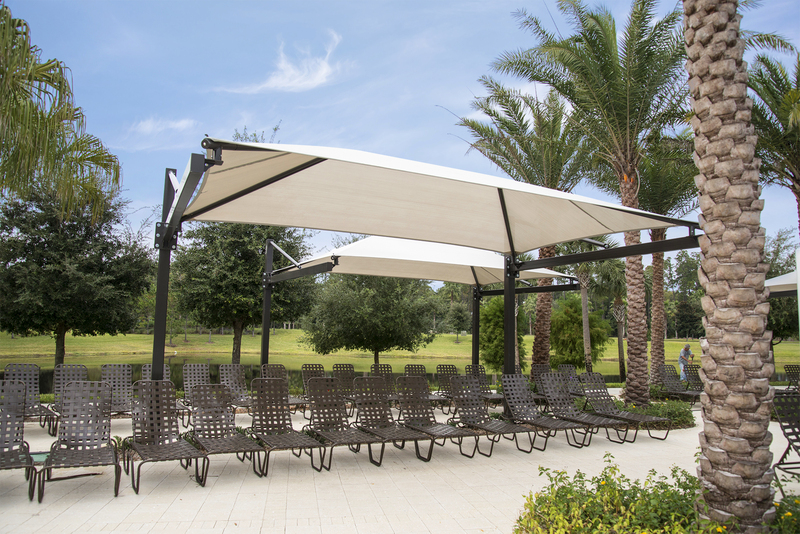 This set of wind shade products allow Superior to quote shades same-day where it used to take up to two weeks to quote a custom shade for areas prone to more wind. Do you have customers near the ocean? When the off-shore air starts its' rapid inland movement, this is what you want for your clients. No need for a custom design! Our set of standard shades are already engineered and designed to be stronger for coastal areas. From umbrellas and hip ends to sails and cantilevers, all of our standard shades with the Glide Elbow are now available for areas with higher wind speeds. Browse the shade structures below or contact us to start your shade project!